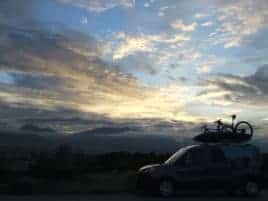 After several months, even years, of studying small campervan options, Alice and I decided the best option for us would be a Wayfarer campervan. We had three requirements. Our campervan had to be economical (25mpg or better), fit in the garage and small enough to be used as a daily driver when needed. After these months of anticipation, the day had finally arrived to make to make the long journey from London, KY to Colorado Springs to have our Wayfarer kit installed. We packed up our little dog Rocco, our sleeping bags, a backpack stove, a few clothes and we were off for the west. We figured it would be more fun to make the road trip to Colorado than to have the kit shipped to Kentucky. After the kit was installed (in less than an hour), Ian Horgan, the owner/operator of Wayfarer Vans suggested we camp the first night at Cheyenne Mountain State Park. The mountain campground was one of the most beautiful places either of us had ever camped. The campsite, high on a mountainside, had a fantastic view of the southern Colorado Springs area below and the Cheyenne Mountains above. At dinner time, the wind kicked up to gale-force gusts. Alice and I retreated inside the Wayfarer for our first meal with the Wayfarer. After nearly 40 years of tent camping, it was a luxury to be in the Wayfarer as opposed to battling the windstorm in a tent, as we had many times in the past. The next morning, we drove south into New Mexico before turning east and driving through the pan-handle of Texas and most of the way across Oklahoma. We had decided to abandon the interstate to best see the small western cowboy towns. In Oklahoma we stumbled upon Bell Cow Lake Campground in Chandler, Oklahoma. This city operated campground is known as the “Best Kept Secret in Central Oklahoma.” The campground was very remote yet beautiful. We slept with the sliding side doors of our new Wayfarer wide open to better feel the cool breeze throughout the night. After sleeping in a bit and enjoying a leisurely breakfast, we set out for Arkansas. Alice and I collect states like some others might collect stamps or baseball cards. Neither of us had ever been to Arkansas, which would make 45 states visited for each of us. After having lunch in Eureka Springs, we drove several hours through the Ozarks before finally reaching the Mississippi River Delta. We had left the rolling hills behind. The topography now was as flat as a tabletop. Cottonfields lined each side of the road for about as far as one could see. We stopped for the night at Crowley Ridge State Park near the tiny village of Walcott, Arkansas. It was quite the luxury not to worry about setting up camp. With our new Wayfarer all we had to do was fold out the bed and camp was set up. The 4-foot wide bed is plenty big enough for two adults and a small dog. The Wayfarer bed is closer in size to a full bed than a twin bed. After a great campsite dinner, we again settled into our Wayfarer for one of the most peaceful nights of sleep ever. Once again, we left the sliding doors open to feel the night breeze on our faces as we slept. The next morning, we toured the boot-hill area of Missouri before crossing the Mississippi River into Tennessee and finally our home state of Kentucky. In all, we crossed 10 states on our journey. We traveled 2,907 miles and drove a bit over 51 hours in only 5 and half days. Our Promaster City got 25.9 miles per gallon on the trip. Every mile and every hour of the trip was an adventure and a joy. Where will our next Wayfarer adventure take us? Maybe Rocky Mountain National Park? Maybe Glacier National Park, or even the Alaskan Highway. Except for our clothes, our Wayfarer is permanently packed and awaiting our next adventure.